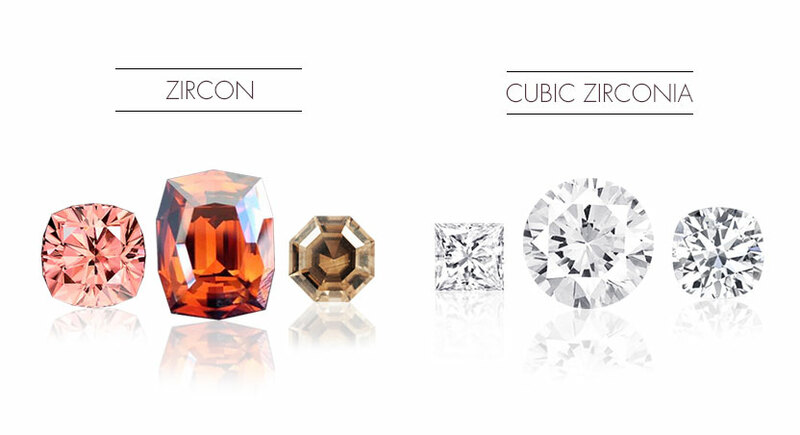 Zircon is often confused with cubic zircona, and while these two materials may sound similar in name, that’s where the similarity ends. Since the late 1970s, cubic zircona has become a household name. Cubic zircona is zirconium oxide (ZrO2), a mineral which is synthesised for use as a diamond simulant. Cubic zirconia has been used in the jewellery trade as an alternative to diamond. Its popularity grew quickly due to its incredible likeness to diamond in terms of its hardness, optically flawless colourless appearance and, perhaps most importantly, its low cost. Cubic zircona enabled those who might not normally be able to afford to buy diamond jewellery the opportunity to own a piece containing a simulated gemstone that looked and felt almost as good as the real thing. Cubic zircona also became popular with people who already owned high end diamond jewellery but who preferred not to wear it all the time, either for security reasons or because they felt it was too good or too valuable to wear all day, every day. Zircon, unlike cubic zircona, has been around for many years. The zircon mineral deposit found in Western Australia has been dated back 4.4 billion years, making it the oldest, datable mineral on Earth. As a gemstone, and prior to the introduction of cubic zircona, zircon was considered by many to be the closest, most affordable alternative to diamond, due to its similar features, most notably its brilliance and fiery appearance when cut and polished. While not as strong as diamond (zircon is 7.5 on the Mohs scale whereas diamond is 10), and heavier (a zircon gemstone with the same carat as diamond will be smaller than a diamond due to its denseness), zircon makes a brilliant addition to any piece of jewellery, either on its own or when set amongst other gemstones. Like diamond zircon has a high refractive index but, unlike diamond, zircon is doubly refractive, thus giving any piece of jewellery, whether an engagement ring, a necklace or earrings, the appearance of greater dazzle and sparkle. Zircon gemstones can be found in many colours and hues, with each one giving off brilliant luminance. Zircons, which are red, brown, orange or yellow in colour, are known as Jacinth zircon. The pale or colourless variety of zircon is called Jargoon (colourless zircon is also known as a Matura Diamond). Zircon which is dazzling blue in tone is called Starlite. Unlike cubic zircona, zircon deserves to be the centrepiece of any piece of jewellery, but since the late 1970s the popularity of this unique gemstone has waned somewhat. However, lately it is enjoying a resurgence, and deservedly so. If you are looking for a unique ring for that special proposal and want a gem that has the dazzle of diamond or the luminosity of sapphire, but perhaps at a slightly more affordable price, don’t be quick to dismiss zircon purely on the basis of its name. If you take a moment to really look at this beautiful gemstone you will see that it deserves to be worn proudly on the third finger of the left hand or indeed as the centrepiece of any item of jewellery.